Connected Data has launched its cloud-free Transporter storage box in Europe. A second-generation version is due to go on sale in the US. The upstart hardware maker, which yesterday announced a merger with file storage firm Drobo, is betting that not everyone is keen on doing backup and storage over a distributed network owned and operated by a third-party, and that some people simply want a single piece of hardware within easy reach. By having a hardware-based file sync'n'share product, Connected Data is very much breaking the sync'n'share mould - but says it's worth it to customers who can sometimes run out of free capacity on the cloud-based alternatives. The Transporter is a 2.5-in disk drive mounted upright in a small vertical tower enclosure with all the processor gubbins in the round base. It can be used as a data protection and file sharing and syncing device in a single location with multiple users' devices. But it really comes into its own when Transporters are networked between locations and files and file changes are replicated between them. Files to be transported are stored on the device and accessed by authorised and connected end-user devices like notebooks and tablet computers. Transporters connect to a router and provide a peer-to-peer network with files copied to one replicated to all the others in a network of them, be they in the next room, building, street, town or continent. No data is ever stored "in the cloud" so that security worry goes away. Any changes made to the files by any device connected to any Transporter in the network are replicated to all the other networked Transporters with no intervening cloud storage. Makers Connected Data are hoping you'll buy the kit if your file sync 'n' share needs exceed the free capacity offered by the Dropbox-alikes. Then, instead of paying recurring cloud storage fees, you buy your Transporters, hook them up, and that is that - no monthly or annual fees. Simplified interface with full drag-and-drop support, right-click functionality and the ability to share links to files with others. Flexible sync options for limited capacity devices. Users can sync and share critical folders (eg, work documents) while still having the ability to access and share large and non-synced folders (eg, music, photo or movie collections) stored on Transporter from any device. IOS and Android mobile apps support for smartphone and tablet Transporter file access. Enhanced connection technology so users can connect to and access their Transporter files regardless of the firewall security that may be in place. This is similar to Dropbox. Connected Data's CEO is Geoff Barrall, who founded the hardware-accelerated BlueArc filer business, and later sold it to HDS, and also founded Data Robotics, which now goes by Drobo. Several developers and executives involved with BlueArc and the Drobo file sharing device are involved with Transporter too. The version 2.0 product has a Dropbox-style interface replacing the original one and is aimed at consumers, SOHO users and small businesses or remote offices in larger businesses. On Macs, for example, the desktop's top control bar has a Transporter icon and it's a file:folder entity just like Dropbox. Clicking on the icon gets you a dropdown menu. The Windows view is almost exactly like a Windows Dropbox interface. Transporters also provide data protection through having multiple copies of files without the inconvenience of using backup software. Of course they are capacity-limited, with 1.5TB being the maximum any one Transporter can provide. As 2.5in form factor disk capacities increase, then Transporter capacities will grow as well, argues the firm. Connected Data says: "Dropbox is designed for simple syncing, but is too expensive for backing up large media files. Similarly, Carbonite is designed for backup and not for sharing." Transporters do both as well as file sharing. If users buy into the concept - that cloud syncing, sharing and protection will cost mega-bucks over time whereas a hardware-based alternative is a one-off cost - then Connected will have a whole new market to itself. Expect new and me-too entrants to pile in quickly. Transporter v2.0 will be a free software upgrade for all existing customers. 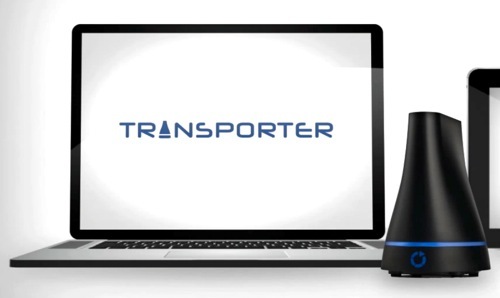 For new customers, Transporter starts at a suggested retail price of £179 without a hard drive, £249 for 1TB and £325 for 2TB. Transporter v2.0 will be available in June 2013 from a national network of partners. CMS Distribution, a consumer and SMB storage distribution specialist, has the European distribution rights.